Sandringham diamond jubilee 2012. Tea bag holder plate. The piece is in MINT condition. IT DEPICTS A PORTRAIT IMAGE OF THE MUSTACHIOED CHAMBERLAIN WITH HIS TRADEMARK UMBRELLA AS ITS HANDLE. I WILL ENDEAVOUR TO REPORT ON AN ITEM WHICH HAS HAD EITHER; HOWEVER I TAKE NO RESPONSIBILITY IF AN ITEM HAS BEEN TAMPERED WITH AND I CANNOT DETECT IT. The Holy Evangelists Church Normacot Stoke-on-Trent.Commemorative plate. A little wear and small defects to the underside. Both pieces are produced by Weatherby. One is a straight sided mug or cup, the other a curved, rectangular form with rounded corners, plate. Both have an identical design. Maker's Marks: The mug/cup has the green Weatherby trademark - "Durability" running across diagonally on the Union Jack flag with "Weatherby - Hanley - England - Royal Falcon Ware - 4 - 68" in conjunction with an impressed 'England' mark. 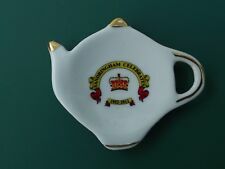 This has the Royal Navy motif on from HMS Neptune and it reads Regnare est Servire, and the word Neptune at the top. This is a large size and hold 1 pint. Great piece for Naval / Military / Militaria collector. Keine abplatzer oder risse. auch sammlerwürdig. Clearing out the loft a 50th anniversary mug to celebrate 50 years of liberation from the Germans in World War 2. Non smoking household. Jubilee Consecration St.James's Church Chorley 1878-1928.Cup. Has wear to base,and blemishes. SILVER JUBILEE. KING GEORGE V AND QUEEN MARY. SADLY WEAR TO GILDING ON RIM, AND EXTENSIVE CRAZING TO GLAZE. HAVING A CLEAR OUT OF ALL THAT I HAVE BOUGHT AND NEVER OR HARDLY USED IN THE PAST. City of Stoke Athletic Club. Northwood Five Mug. Reiseandenken aus den USA, ca. 80er Jahre. Mit geringen Alters- und Gebrauchsspuren (siehe Foto(s)). Andenken an Koblenz Herlet's Magazin (siehe Detailfoto). Höhec a. 7,5 cm. Es lohnt sich. 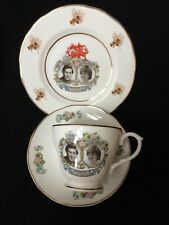 China Tea Cup - George VI 1937 Coronation. Coronation of Edward viii China Mug by Clarence ware Beresford bros London. 12 may 1937. 1 Befestigungsstift an einer Seite des Deckels fehlt, sonst gut und unbeschädigt. Nicht sichtbare bzw. Die angegebenen Maße sind Circa-Maße und können minimal abweichen! Adams China Beaker - Edward VIII 1937 Coronation. 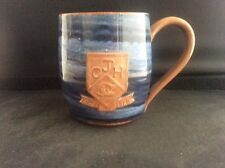 St.Joseph's Church Burslem Diamond Jubillee Mug Cup.Parish Priests. CORONATION JUNE 1911. GEORGE & MARY. NO MAKERS MARK. 7CMS TOP DIA X 9CMS HIGH. Die Plattform finden Sie unter. Originaler, hübscher Andenkenkrug an Schwetzingen. Größe mit Deckel: 14 cm. Erhaltung: verstaubt, gebraucht, sonst gut, alles weitere siehe. Zum Verkauf kommt hier ein kleiner Andenkenkrug, ein Kinderkrug aus der Zeit um 1900. Gruss aus Passau, Ansicht Passau. - und Gebruchsspuren - Deckel wackelt leicht. LIMITED EDITION ~ CAVERSWALL. CHARLES & DIANA WEDDING. COLLECTABLE GILDED DISPLAY PLATE. Tiefe Andenkenschale Dresden von der Carolabrücke um 1910. Schließen Sie den Warenkorb bzw. 50th Anniversary of VJ Day Burma Star Tribute Lion Head Beaker / Mug VGC. Lovely limited edition (of 500) mug to commemorate 50th anniversary of VJ day. One side shows the medal and ribbon of Burma star, the other General Sir William Slim. Lion heads to the side. Thanks for looking.